I'm new to Goldcoin but not crypto. I was drawn here by your stance on SegWit and have tried to use your wallet but am having trouble sending coins (receiving works fine). Before I go any further is this the proper forum to ask for help? If not can you suggest another one? Welcome to the Goldcoin forum! Please tell us which wallet you're using (Android, Windows, etc.) and provide some details about the issue you're having with sending. Hello again, thank you so much for your reply. I am using the Windows wallet and I enabled encryption on it. When I go to send coins everything is fine until I get "Error -4". 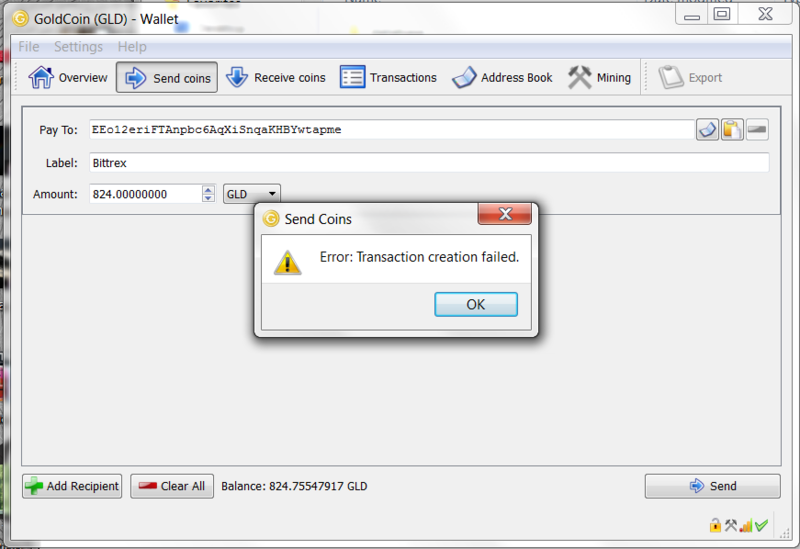 When I go to send coins everything is fine until I get "Error -4 Transaction Creation Failed". Sometimes this error can occur when the wallet is used for mining and has hundreds (or thousands) of tiny mining transactions. This can cause an excessive number of transaction inputs when sending. Try sending a small amount to Bittrex like 10 GLD and slowly move up until you find a maximum working range.